At the Top of Squirrel Spur: Swapped! I just wish y'all could feel this amazing yarn! It's a deep, deep brown. rambouillet from Lowder Colours Farm in Oklahoma. Kate Lowder, a wonder Fiber Femme, drew my name and I have a lovely skein to look forward to working with. She included a picture of the wether that grew the wool and a description, calling him a Reverse Badger Rambouillet that she raised from a Gray Badger Rambouillet ewe named Mandy and a Gray Badger Ram named Roper. I just learned a bit about Rambouillet colors! This swap was sponsored by Fiber Femmes, and we had a nice response to it. We'll be doing another one soon! The weather has turned cold again, and I was thawing out water bottles this morning. It's supposed to be even colder over the next couple of days. The good thing is that this can't last long, right? Lily wouldn't get out of bed to go for our walk this morning; I had to tramp out alone to go meet Kym and Bentley. Smart girl, Lily, as we realized when the wind took our breath! But it was almost worth the chill to see the dawning over the mountains. A thousand soft greens are creeping across the hills and the rising sun casts brilliance and shadows over the new little leaves. Back home I've been spinning (surprise) and running around to meetings and such. And working on web pages and the shop. Things have been busy! Easter is a big family holiday around here, so people are coming back home from far away and stopping in while visiting the folks at home. Mom had a nice Easter dinner for us today; I slipped away from the shop and we had a great meal! Now I'm sleepy! I've been reading the poetry of Edna St. Vincent Millay lately, so I was pleased to find a biography of the poet in one of the boxes that my aunt sent at the beginning of the winter. I knew very little about the poet and her life, so Savage Beauty, The Life of Edna St. Vincent Millay, thirty years in the writing, makes me want to take a new look at the poems. Although I feel that there are some faults in Nancy Milford's biography, seeing the poetry against the background of a life, often troubled but always adventurous, added a new dimension to my understanding. What struck me most about Vincent Millay's life is that genius so often comes out of such a life. Talented people often seem to be driven toward a need for experience, and the depth of their work reveals an understanding of experience that so many of us lack. We need these people to speak for us, out of their pain, to say what we cannot find words to reveal. For my review of Savage Beauty, check out my book review blog. 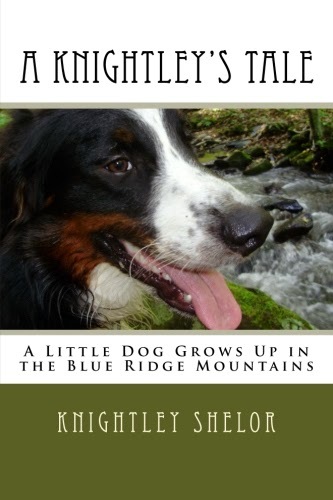 My dog wrote a book. Coming summer 2009 to Mount Airy, North Carolina! 2013 Leslie Shelor. Watermark theme. Powered by Blogger.